ows and provides a convenient preview of MXF files. Play files as you are recording them, view time codes, and set in/out points. Supports AVC-Intra or MPEG-2 wrapped in MXF (OP-1a) files. Plays files while they are being recorded. An SDK that can be embedded into third party applications and control cue-up, play, pause, rewind, fast-forward, stop, and get time code is available. - Windows is a registered trademark of Microsoft Corporation in the United States and other countries. 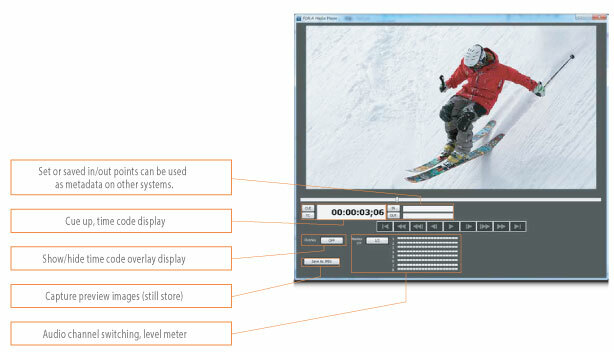 - AVC-Intra is a trademark of Panasonic Corporation. - Other names are trademarks or registered trademarks of their respective owners.